The latest Which? Survey reveals independent opticians achieved the highest satisfaction rates from customers. Which? surveyed 8,465 members (last carried out in 2014) to reveal the best and worst places to have an eye test and buy glasses. Independent opticians came top overall, with a customer rating of 87%, ahead of national big-brand names and supermarkets. 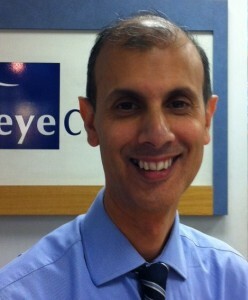 Local independent opticians came top overall with a customer score of 87%. Independent opticians rated the best place to have an eye test – scoring 89%. Independent opticians rated the best place to buy glasses – scoring 82%. We are looking for an experienced Optical Assistant! Comments Off on We are looking for an experienced Optical Assistant! Please send your CV with a cover letter to info@eye-contact.co.uk. Cover letters should be addressed to Arif Karim. The Optomap provides a panoramic digital image of 82% of the retina. It is fast, painless and comfortable for the patient and gives you so much more information than a standard fundus photograph, which only gives a view of 15% of the retina. Patients do not need to be dilated and the Optomap can be used on the practice shop floor without needing a different lighting level. The Optomap can be performed by trained practice staff, who would usually take one colour photo and one with auto flourescence on each eye, which then become available to view in the test room immediately. You can zoom in and out of the retina and look underneath at the choroid and view the blood vessels in high definition. You can also demonstrate the difference in the view of the retina given by the Optomap compared with the view obtained by standard imaging. We are open up to and including the 21st December 2018. From the close of business on 21st of December until 1st January 2019 we are closed. We re-open again on 2nd January, 2019. Thanks for all your support this year. We wish you a very heartfelt Merry Christmas and Happy New Year! P.S. 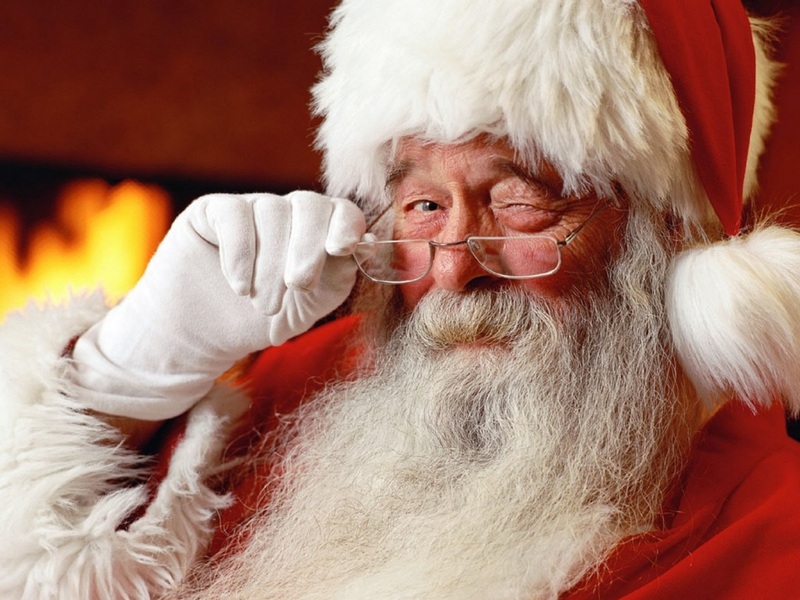 If you need contact lenses in time for Christmas, please order by the 14th of December. For the first time, the engineering prowess, soul and style of Ducati has been realised in a performance eyewear collection which is now available in selected Ducati stores and Eye Contact Opticians, Liverpool Street. 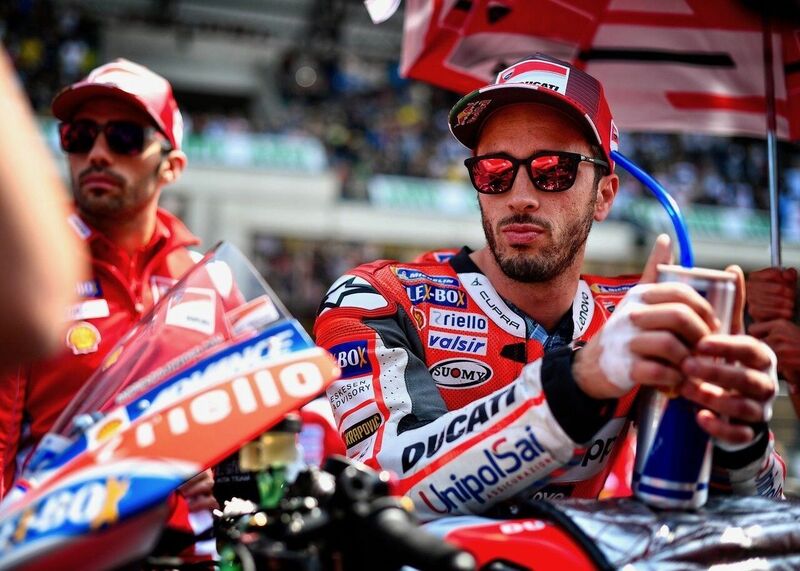 Now available at Eye Contact Opticians, The Ducati Eyewear Brand is supported by their Moto GP and British Super Bike racing teams. Andrea Dovizioso is our leading Ambassador and his signature limited edition piece is featured in the range. How often should I have my contact lens check up? Comments Off on How often should I have my contact lens check up? The law requires that contact lens patients should have an up to date check up within the last 12 months to continue purchasing lenses. The reason for this is to ensure that your eyes stay healthy and comfortable with continued contact lens wear. This means that your Optician will normally recommend a recheck after a 12 month period. Depending on how you are getting on with your lenses, it may better to have a check-up more frequently, at 6 or 8 months, particularly if you are experiencing any discomfort while wearing your lenses, such as dry eyes (we also provide a separate dry eye consultation, see http://www.eye-contact.co.uk/ for more details). 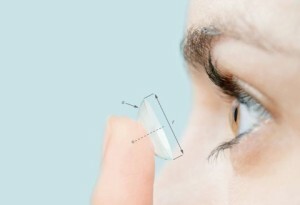 Contact lens technology is constantly developing – for example Silicone hydrogel contact lenses are advanced soft lenses that allow more oxygen to pass through the lens to the cornea than regular soft (“hydrogel”) contacts. The check up with the optician will enable them to assess whether there are alternative products which could be better for your eyes. 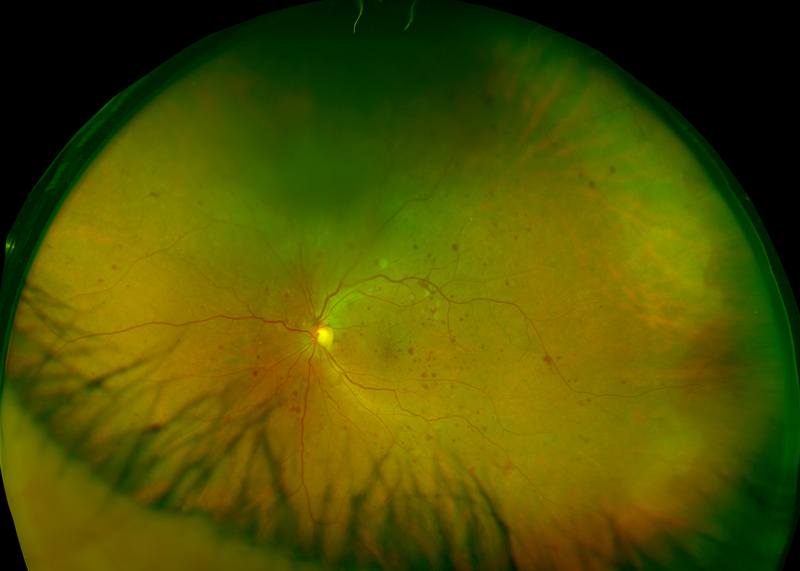 Latest Retinal Imaging technology, Optomap Ultrawidefield Image of Retina showing signs of Diabetic Retinopathy. As its Diabetes week this week, we wanted to promote awareness of Diabetic Retinopathy. Here is some info from NHS England on the eye related complications that can arise from diabetes, and why eye testing is free for diabetic patients. maintaining a healthy weight, eating a healthy balanced direct, exercising regularly, and not smoking. Frames MUST LIFT: Specs look best when they lift the cheek and eye area at the bottom outside corners of the frames upwards. Your eyes should be centered within the frames: They don’t need to be absolutely dead center, but thereabouts is good. Match the scale of the frames with your facial proportions: Bold, oversized frames are dramatic and fabulous, but that doesn’t mean they will work for you. A small person with dainty facial features is overwhelmed in thick, chunky frames. But that person can still wear bold frames if they choose a refined version of a chunky style. Follow the line of your brows: Choose a frame shape that mirrors the arch of your eyebrows. Don’t be scared of extra width: Many people wear specs that are too narrow for their face. 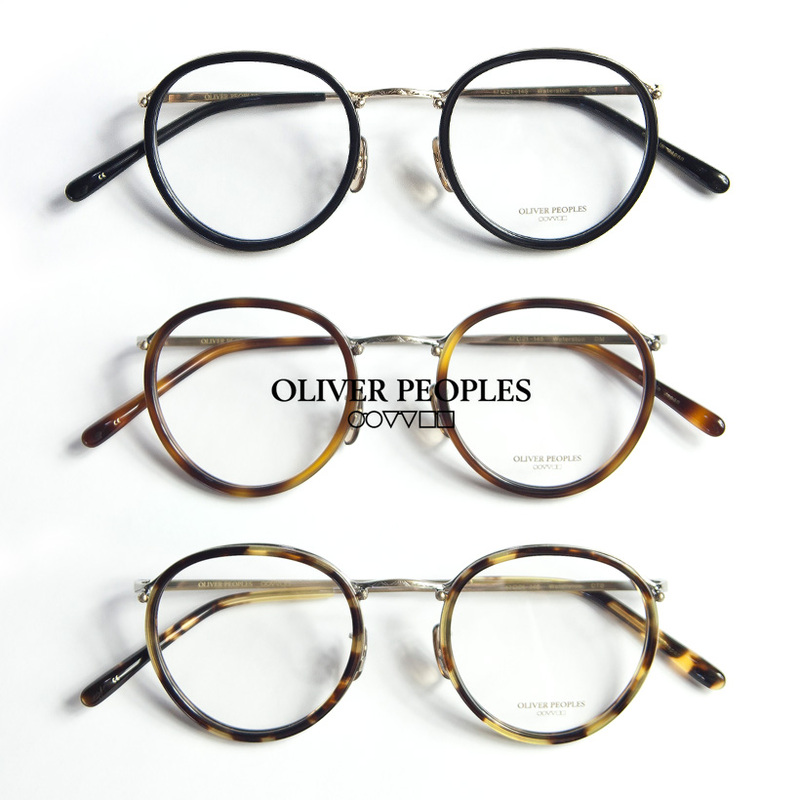 Their eyes may be centered and the style “lifts upwards”, but the narrow width of the frames constricts the face. You want a shape that “opens up” the face, so add a little width to the top outside corners of the frames. It makes a world of difference, often balancing out a pear shaped face. Think in three dimensions: You see your frames from the front, but everyone else sees them from all angles. They also catch glimpses of the inside of the frame. That’s why it’s important to pay attention to temple and inside colour detailing. Choose a color that complements your skin tone and eye colour: The operative word is “complement”, not “match”. Bright blue-eyed people shouldn’t wear bright blue specs. But wearing brown specs with blue detailing might be ideal. Do not confine your choice to neutral tones either. Eyewear does not have to match what you’re wearing, but rather go with everything because it compliments your face, not your clothes. Create the right amount of contrast: If the contrast between the colour of your skin tone and the frames is too strong, you’ll look severe. If it’s not strong enough you’ll look blah. This is not a hard and fast rule, but generally, choose a colour that is different to the colour of your hair and eyes.